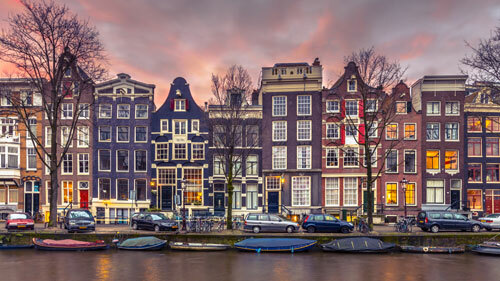 Amsterdam has a rich history and many different areas. 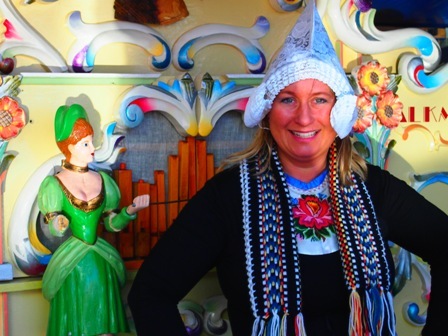 Discover the Dutch capital together with Ingrid Marsman, an experienced local guide and actress. Her theatrical dinners are informative & entertaining. A unique way to learn about the city & enjoy a group dinner ! 3 historical women who walk between the courses from one restaurant to the other. Princess Beatrix starts at Dam Square. She tells about the Royal Palace and walks to the starter. Then Rembrandt’s wife brings the group in his footsteps to the main course. She offers the group a book about her and Rembrandt in Amsterdam. Then brothel owner Theresa walks through the Red Light District to a place for dessert where she offers 3 Dutch liquors. Imagine, you enter the bar of Giertje in 1610. She serves cold beer, cheese and ‘bitterballen’. After a short story about Amsterdam, the group is brought to the ships room to “sail off to Asia”. 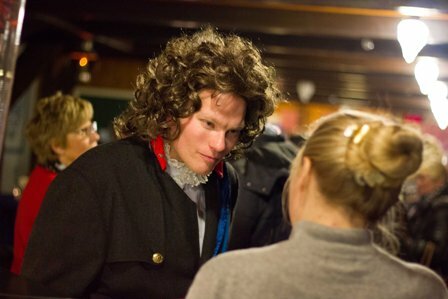 Each sailor get a jacket and a Dutch gin against sea sickness. A ships dinner is served. Between the courses several women appear; a poor sailor’s wife, a rich merchant’s wife and a brothel owner looking for sailors in the harbor. Dessert comes with Dutch liquors to taste. Jannie has lived in the Jordaan all her life. Dressed in a tiger print outfit she shares her stories. The walk starts with a drink and a Dutch ‘bitterbal’ in a typical Dutch ‘brown café’. Then Jannie walks with the group through the small streets to the starter, main course and dessert. There she shares 3 Dutch liquors together with the stories about love and seduction. Zaandam, the city where Claude Monet and Peter the Great lived. In the Golden Age, hundreds of mills processed wood here for the shipbuilding and paper industries. Discover Zaandam and its restaurants on our Dinner Walk of 3 hours, with Camille, the wife of Claude Monet, the carpenters’ wife where Peter the Great stayed and the Mayor’s wife of Westzaan, wearing a typical Zaan costume. The capital of the province of North Holland, located on the river Spaarne, giving it its nickname, Spaarne city. Discover culinary Haarlem together with actor guide Ingrid Marsman. Her special dinner walks are informative and entertaining. She plays 3 historical women (Kenau, Liesbeth -the wife of Frans Hans- and Malle Babbe). They show the city through their eyes and walk with you to 3 different locations for a 3-course dinner. 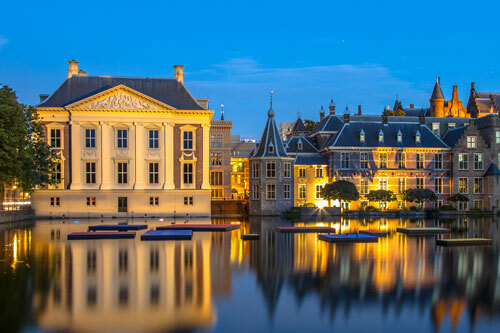 The Hague is the governmental city of the country. It is also where King Willem Alexander lives. Discover culinary The Hague together with actor guide Ingrid Marsman. Her special dinner walks are informative and entertaining. She plays 3 historical women :(princess Beatrix, Maria van Berckel and Aleida van Poelgeest) who walk with you to 3 different locations for a 3-course dinner. 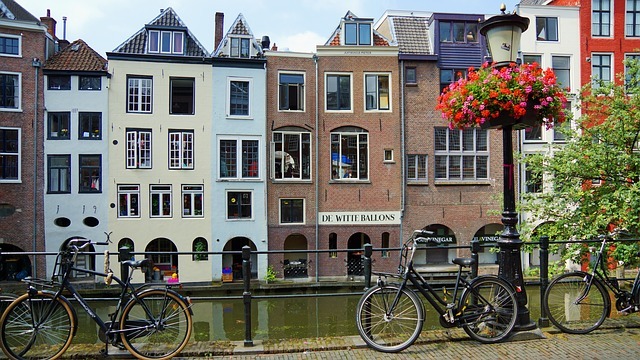 Utrecht is located in the heart of the Netherlands, and an important religious centre with many beautifull churches. Discover culinary Utrecht together with actor guide Ingrid Marsman. Her special dinner walks are informative and entertaining. 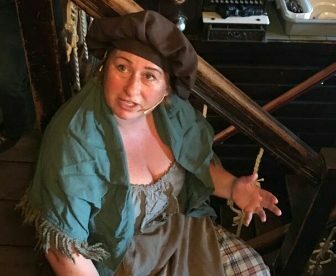 She plays 3 historical women (sister Bertken, Trijn van de Leemput and a brothel owner of the 17th century) who show the city through their eyes and walks with you to 3 different locations for a 3-course dinner. Hoorn was founded in 716 and became a major harbor town. During Holland’s Golden Age, Hoorn was an important home base for the Dutch East India Company (VOC). Discover culinary Hoorn with three women from former times, and dinner in three different restaurants. Enjoy! Edam is a picturesque village, famous for its cheese. 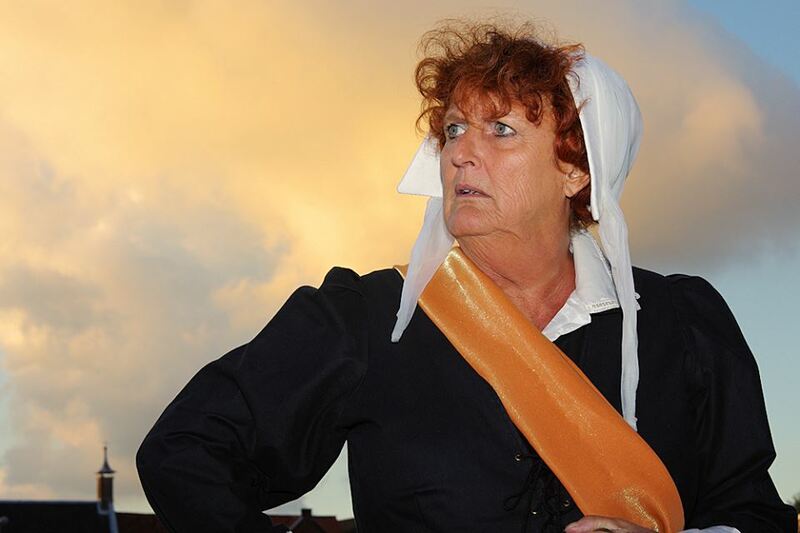 Discover Edam with Trijntje Keever, born in Edam in April 1616. With 2.54 meters she was possibly the tallest woman to have ever lived. In Voledam Hille Butter takes over. Volendam is a former fisher village, well-known for its lovely harbor and the traditional clothing. Hille was a Dutch model and, according to artists in her time, the best model of the village. During the tour, a three course dinner is planned in different restaurants.